The Rockets have finally made their choice, hiring Mike D’Antonio as their new coach. It’s only fitting that the Houston Rockets, led by a player who doesn’t play any defense, are hiring a coach that doesn’t coach any. The Rockets have made their choice, working to finalize a deal with Mike D’Antoni to be their new head coach, as first reported by Adrian Wojnarowski. D’Antoni was an innovator with the Phoenix Suns from 2003-2008, setting trends that are clearly visible in today’s NBA. He ran a fast-pace, high-octane offense centered around fast breaks, quick shots, pick-and-rolls and three-pointers. He averaged 53 wins a year in Phoenix, going to the Western Conference Finals in 2005 and 2006. But two failed stints in New York and Los Angeles since then have taken the shine off as he’s been unable to duplicate the success he had with Steve Nash, Shawn Marion, Amare Stoudemire and those Suns teams. 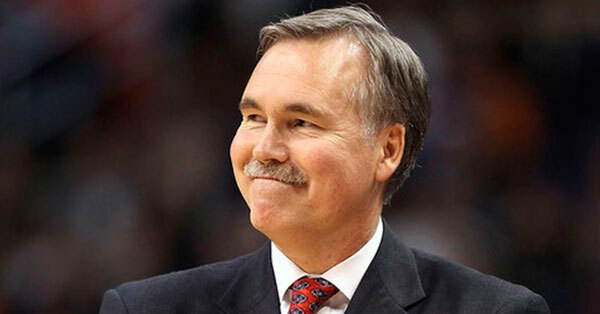 D’Antoni comes to the Rockets after nearly a full season as an assistant with the Sixers. From a team needs standpoint, this is a shocking move. At his season-ending press conference (see video), Rockets general manager Daryl Morey was asked what the team was looking for in a coach. “I think it’s going to be someone who embodies what we need which is we need to get our defense stronger,” said Morey. In his 11-12 seasons as a head coach in the NBA, D’Antoni has never had a Top 10 defense. On the other hand, is it really that surprising? Rockets owner Les Alexander makes these coaching hire decisions and has long been in love with those Phoenix teams. Former Rockets coach Jeff Van Gundy, after being let go by the team in 2007, famously said that Alexander wanted to model the Rockets after D’Antoni’s Suns. The problem is the Rockets, nearly a decade later, already implement many of these offensive philosphies. The team was 8th in offensive efficiency in 2015-16, shooting the second-most three-point attempts in the league per game. The problem was they didn’t have the shooters/scorers. The key to improvement on offense, with or without D’Antoni, will be on roster upgrades — primarily adding shooters. But upgrading their defense, which the team was expected to do by hiring a strong defensive coach, will now be more of a challenge. The Rockets were 20th in defensive efficiency last season. D’Antoni has experience with both James Harden and Dwight Howard. He was an assistant coach with the 2012 USA Olympics team that Harden was a part of. He also coached Howard in 2012-13 with the Lakers, though it was not a great experience for either coach or player. It is largely expected that Howard, who holds a player option on his contract, won’t be back with the Rockets.